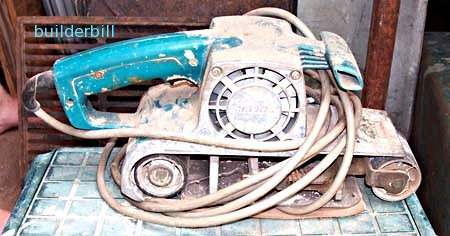 A hand held carpentry power sander that uses the linear action of a cloth and resin based belt running around two wheels. 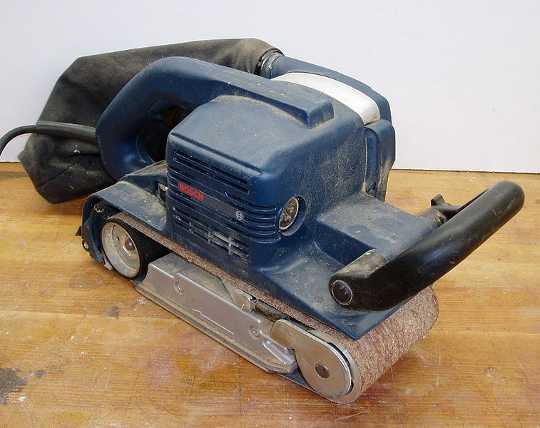 Mostly used as a rough to intermediate sander. A small hand held belt power sander that has a short length and a flush side that allows it to get in small places. Much like an angle grinder these machine have a flexible rubber disk or a soft foam pad for fixing sanding disks to. Often with different speed settings and used as a polisher. Used for work on flat and curved surfaces. A standard two handed use sander that uses 75mm or 3" wide belts complete with dust bag. These machines are used for coarse sanding and almost always if a fine finish is needed then another finish sander is used later. An old battler that must be at least 30 years old and still doing the job. My old and much used Makita sander above is again a 75mm or 3" wide. The machine comes with a dust bag, (not shown). The belts that it uses are 76 x 457 as shown below. 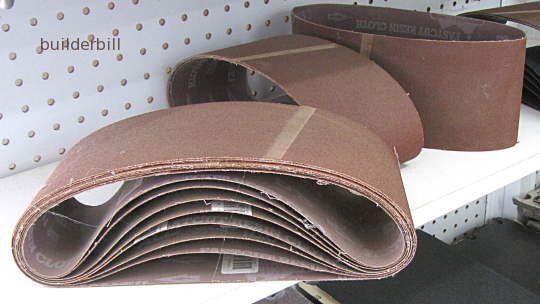 This type of sander comes in a couple of sizes, 75 and 100 belt width. There are also other smaller narrower sanders for special application. These sanders are great for fairly rough work. They can quickly cut though old layers of paint or in a workshop situation dress off frames. Care must be taken with these machines because in the wrong hands they can really dig in and spoil the work. The trick is to keep them moving all the time, be careful not to linger too long in one spot. They cut really well when angled across the grain of the timber. Belts are belts, right? WRONG, get the best belts that you can from a reputable manufacturer. Look after your belts by keeping them dry. Where I live we get a lot of humidity and it plays hell with the glue joints. I always try to keep them in sealed bags until I need them. Looking like an angle grinder but having a lot slower rev range these tools are also used for hard and rough sanding. For instance I used my 180mm sander/polisher for taking off the gelcoat on a small sail boat that I once owned. It was ideal for working on the curved surfaces. As with the belt sander it is a machine that can do a lot of damage in the wrong hands. A light and gentle touch with a fairly smooth grit to start off is recommend. Then use the rough grit when you have a feel for the tool. The green disk above fits onto a flexible rubber disk with a threaded flat round plate. No adhesive needed. The left hand disk is an interesting one. It is known as a flap disk and it is used in a standard angle grinder. As the grit and backing wear away they expose a fresh layer of grit and so on giving a lot longer life than a standard disk. The are of course used for different work as there is no flexibility to the flap disk and angle grinders rev a lot higher than sanders.